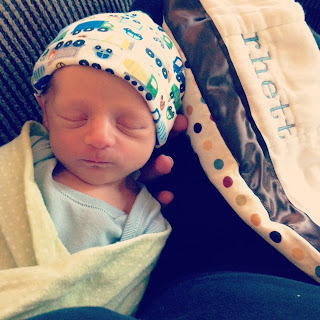 Choosing Joy: Sweet Baby Rhett-- 2 weeks old! Sweet Baby Rhett-- 2 weeks old! I took Rhett to the doctor yesterday for a weight check/two week check up. At his 3 day check up he weighed 5 lbs 1 oz. Yesterday he was back up to 5 lbs 10 oz, which makes me VERY VERY happy! He was 19 1/2 inches long (which is up half an inch from his birth length). Our family doctor said he looked great and even gave me the green light to go from every 2 hour feedings to every 3 hours... now if Rhett would only get that memo. I can't remember what my life was like without Rhett. I am so much happier having him here than being pregnant. My days are short and nights are long now... but he really is SUCH a good baby. Just in the past couple of days he has started getting fussy and wanting to be held 24/7, which makes things very interesting, but I am getting really good at doing everything one handed. I am grateful that we have had so much help. Our friends have brought meals and gifts for big boy. Our family has been over to help or take Hudson a lot. Bryan was off for two whole weeks and they went by so so fast, but I am glad that he got that time off. Bryan was supposed to go back to work on Wednesday, but he didn't sleep at all Tuesday night so he took an extra day off with us. Yesterday was my first day completely on my own with both of them. Here is what I have figured out so far-- I need to just be EXTRA prepared. We got Hudson an "Ok to wake clock" which shines green when he can get out of his bed and set it for 7 am (instead of whenever his heart desires, like 5 am...) and told him that he could get out of his bed and call for momma when the clock turned green. I have been getting up at 6 with Bryan, nursing Rhett and getting everything for the morning situated before Hudson gets up. This morning I even got a shower and got Hudson's breakfast made before 7! I am a firm believer that the way you start your morning sets the tone for your day-- I am, and always have been, a morning person. I like for my house to be tidy, curtains to be open, bed to be made... before I sit down with my coffee, and this schedule allows me to do that. Now, I may crash at 8 pm, but that is nothing new! The rest of our day yesterday was interesting. Rhett is usually really good in the morning so I put him in his pack and play while I did a few chores. I cleaned the bathrooms and vacuumed (also may have overdone it a bit)... Rhett had his doctor appointment so we took Hudson to spend time with G-ma and Aunt Doe at work... because I was not about to try to tackle two kiddos in a waiting room infested with strep/flu/rsv... after Rhett's appointment we came home, I nursed Rhett, fed Hudson and let him watch a little show. Then I had everything on track for nap time. In my head, Hudson would nap which would give me time to pump, eat lunch and nap with Rhett. Unfortunately things don't always work out like I have them in my head. Hudson (who is the best sleeper EVER) decided that yesterday was the one day he did not feel like taking a nap. He did spend a few hours of "quiet time" in his room... which was great, but he acts like a crazy mad man when he doesn't nap. So momma didn't get a nap and then I had the brilliant idea to give my already crazy, mad-man 2 year old a Popsicle. It was beautiful outside so I put both boys in our new stroller (jury is still out on whether or not I like it) and we went for a stroll around the neighborhood. I now understand why they want you to wait to really work out because I was SORE and SO tired after our 90 minute stroll. 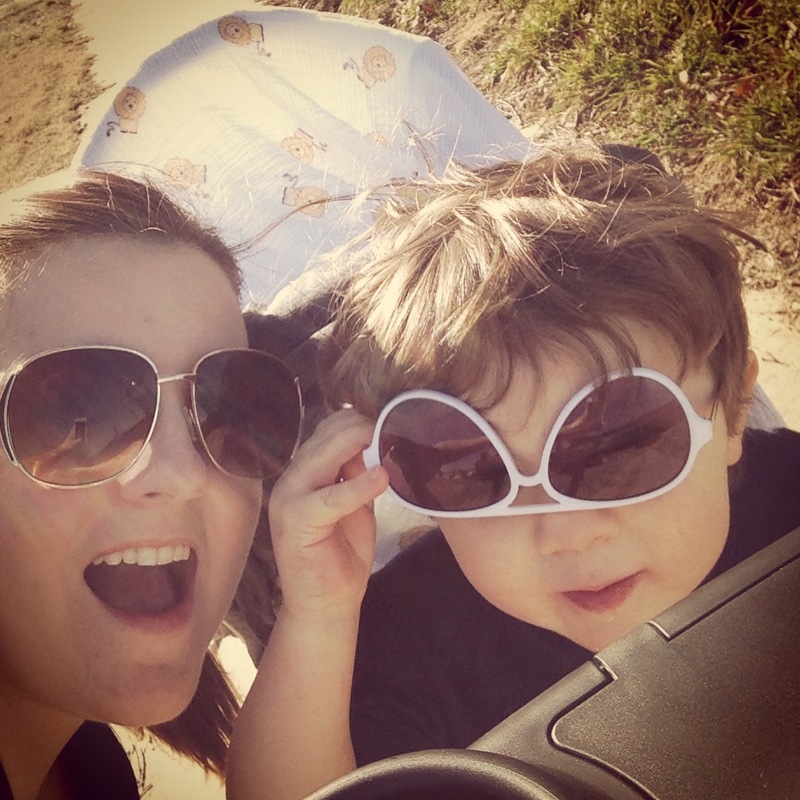 We met up with my friend, Laura, and her little girl for the last part of our walk and then headed home to make dinner. He may be a stinker, but I do love him so much. I had already made pizza dough while big boy was "resting" and just needed to roll it out and throw on the toppings before Bryan got home. We love THIS healthy recipe for BBQ Chicken Pizza. Hudson wanted to "help too" and pulled his little chair over to the counter and then proceeded to open EVERY drawer, cabinet, etc... pour spices all over the counter... eat all the cheese off of the pizza... all the while Rhett was ticked and crying so he went in the sling so I could finish cooking. Bryan finally got home, I threw Hudson's cheese pizza in the oven and waited to cook ours. Apparently I had the oven too hot because the cheese was SO burnt on our pizza, I set the smoke alarm off (which happens frequently because they installed it right over my stove and usually isn't a big deal but Rhett has JUST fallen asleep) and at this point Bryan and I just started laughing. And I, no kidding, was in bed by 8:30. So I survived Day 1. Day 2 is going ok so far. 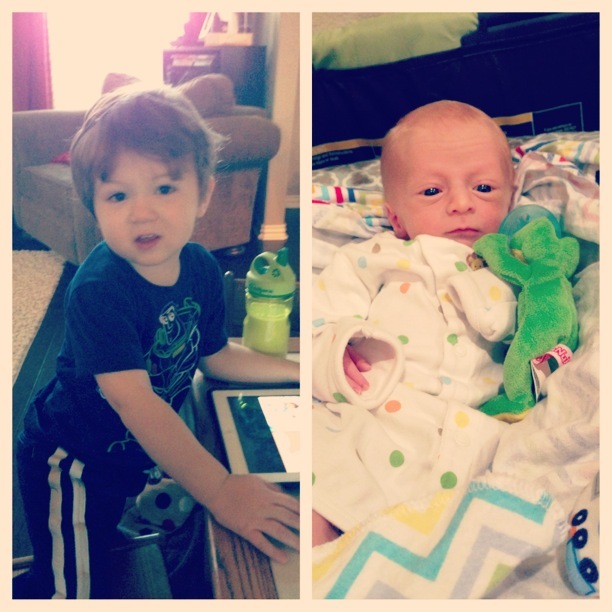 Hudson is currently "rocking" Rhett in his Rock n Play. My grandma will be here in a bit to hang out for a few hours so it will be nice to have some reinforcements. I know every day will get easier and I will be able to cope better once I start sleeping longer than 2 hours at time. No matter how hard it is, I am loving being the momma of two sweet boys, and I am trying to cherish each (sleepless but cuddly) moment, because I realize how fast they grow up. My heart is so full of love for my little lovies and just when I start to get frustrated with them, Hudson does something really sweet like tell me Rhett is his best friend or lean over out of no where and give Rhett a big kiss... 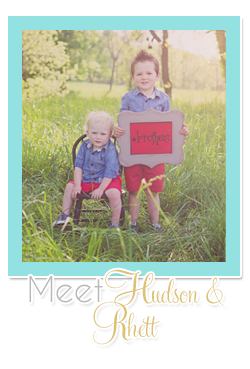 I tell him "just wait Hudson, You and Rhett will fight and be angry at each other... you'll argue over toys and candy and probably time with mom and dad... but at the end of the day he's your brother and you're right, he will probably always be your best friend." And I love that. I love reading your blog! 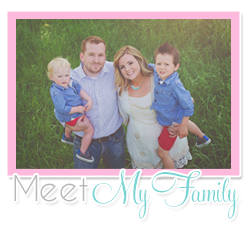 I remember life with my 2 year and a newborn! I also remember the first day my husband went back to work. I just cried and cried! I was terrified! But it worked out and now I have a four year old, a two year old and I'm expecting baby girl #3 in about 6 weeks! I'll be right there with you again! Good luck! Your boys are precious!